The first half of Gary Shteyngart‘s new memoir, Little Failure, reads like a first-person Colbert Report segment on Russian Jewish refuseniks. The celebrated Russian émigré novelist wastes almost no page space on developing such trifles as plot or character. We know the premise (Russia is a bad place), and we know what gets the family through (faith that America will be better). 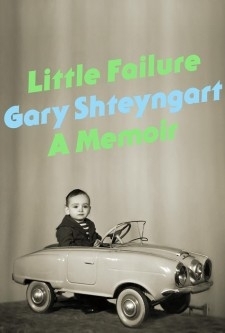 Shteyngart’s wit is really the main engine of the memoir. His descriptions are volatile: The first non-canned tomatoes he eats explode in his mouth “like grenades”; school hallways are “snot-colored.” The first half of the book might be more successful if he was more concerned with the interiority of four-year-old Gary rather than the monologue of 40-year-old Gary. But once the young Shteyngart starts high school in America and is self-aware enough to own his swaggering neuroses, his character comes vividly, stunningly alive on the page. The short, later chapters are more joyously self-deprecating as the older Shteyngart unabashedly makes fun of his proto-sexual self, masterfully detailing not only Jewish and immigrant alienation, but also that of a sexually frustrated teenager, a nerd, and someone who grew into adolescence just as everybody else was growing out of it.